4Health dog food is a private label brand made for the Tractor Supply Company. It is manufactured by Diamond Pet Foods, Inc., owned by Schell and Kampeter, Inc. (no website available). They are a U.S.-based pet food manufacturer with plants located in Meta, Missouri, Lathrop, California and Gaston, South Carolina. The company is a family-owned, privately-held enterprise, still managed by the Schell and Kampeter family. The headquarters for Diamond are in Meta, Missouri and the company was founded in 1970. At that time brothers-in-law Gary Schell and Richard Kampeter bought Milling Meta Co., a producer of livestock feed and dog food. Early distribution was limited to within 100 miles of Meta, Missouri and only about 5 percent of the company’s production was dog food. Diamond expanded its manufacturing to include plants in San Joaquin County California in 1999 and Gaston, South Carolina in 2002. Tractor Supply Company, with more than 1000 locations all over the U.S., is based in Brentwood, Tennessee. TSC has annual revenue of more than $4 billion and Fortune magazine named them to its list of the 100 fastest growing businesses in 2004. TSC launched 4Health as a premium private label dog food in early 2010. The food is marketed as an affordable pet food that provides dogs of all ages and sizes with nutritional ingredients for optimal health. Since the launch they have added a grain free formula. There is also a 4Health food for cats. According to Tractor Supply Company, the food is priced up to 20 percent less than similar national brands. 4Health was part of a large voluntary recall by Diamond due to Salmonella in May 2012. As with many private label brands, information about 4Health is harder to find than for national brands. However, Tractor Supply Company does provide ingredients and nutritional information on their company web site, so you can find out more about this food than many other private label foods. They do advertise the food in their store circulars, too. Since it is a private label brand you can only buy it at Tractor Supply Company stores. 4Health formulas include Puppy Formula, Small Bites Formula for small breeds, Performance Formula for adult dogs with active lifestyles, Large Breed Formula for large breeds, Chicken & Rice Formula and Lamb & Rice Formula. Each of these formulas has meat listed as its first ingredient, and none of the formulas use poultry by-product meal or artificial colors or flavors, according to the company. They don’t use corn, wheat, or soy and they feature fresh chicken and real salmon. They also have a Salmon & Potato formula, a Mature Adult formula for dogs 7 years and older, and a Healthy Weight Formula. 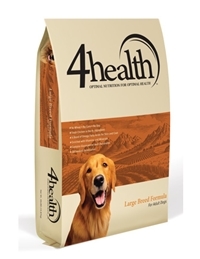 4Health also has grain free formulas: Whitefish & Potato, Beef & Potato, Turkey & Potato, all for adult dogs. These foods have no corn, wheat, soy, or rice and meat is the first ingredient. 4Health also has several canned formulas and some snacks for dogs. Salmon, ocean fish meal (a source of fish oil), potatoes,peas, cracked pearled barley, egg product, millet, canola oil, tomato pomace, natural flavor, flaxseed, salt, choline chloride, dried chicory root, glucosamine hydrochloride, dried kelp, carrots, apples, tomatoes, blueberries, spinach, dried skim milk, cranberries, rosemary extract, parsley flake, yucca schidigera extract, L-Carnitine, chondroitin sulfate, dried Enterococcus faecium fermentation product, dried Lactobacillus acidophilus fermentation product, dried Lactobacillus casei fermentation product, dried Lactobacillus plantarum fermentation product, dried Trichoderma longibrachiatum fermentation extract, vitamin E supplement, iron proteinate, zinc proteinate, copper proteinate, ferrous sulfate, zinc sulfate, copper sulfate, potassium iodide, thiamine mononitrate, manganese proteinate, manganous oxide, ascorbic acid, vitamin A supplement, biotin, niacin, calcium pantothenate, manganese sulfate, sodium selenite, pyridoxine hydrochloride (vitamin B6), vitamin B12 supplement, riboflavin, vitamin D supplement, folic acid. I chose this food to review because it is listed on the Tractor Supply Company web site as their most popular 4Health food, so a lot of people are buying it. And, I was talking to a friend of mine the other day and he said he had been feeding this food to his two mixed breed dogs. He said since he started feeding it that most of their skin problems had cleared up and they were doing much better now. So, I was curious to see what was in the food and if it might be something to recommend to others. First, you should note that the food doesn’t contain any corn, wheat, or soy. The first two ingredients are meat proteins – salmon and ocean fish meal. You have to like salmon as the first ingredient. Not only is it a good source of protein, but it’s also an excellent source of omega-3 fatty acid. And dogs usually love the taste of salmon. Ocean fish meal is a concentrated form of fish protein. Diamond Pet Foods, which makes 4Health for Tractor Supply Company, has stated that they only use fish meals that are free of ethoxyquin as of 2010 and this seems to be true with food such as Taste of the Wild and other products they make. I believe that this food is ethoxyquin-free but this status can change with dog foods, so you might want to re-check this point periodically. The ocean fish meal is also cited as a source of fish oil and it provides more omega-3 fatty acid as well as good oil for your dog’s skin and coat. A good named fat source such as this is important for your dog’s health. The next three ingredients in the food provide carbs and fiber and some additional protein: potatoes, peas, and cracked pearled barley. The potatoes are a good source of dietary fiber as well as vitamin C, vitamin B6, potassium, and manganese. Many dog food companies today are using peas instead of grains like corn. They are high in protein and dietary fiber, as well as being a natural source of vitamin K. They’re also very high in vitamin C. However, some dogs have problems digesting them because of the fibrous cellulose surrounding the interior of the peas. That’s why you see an ingredient such as dried Trichoderma longibrachiatum fermentation extract later in the ingredient list. This is a cellulase digestive enzyme to help break down the cellulose in the fiber ingredients in the food so they can be more easily digested by your dog. Again, some dogs have more or less problems digesting these fiber ingredients in the dog foods that include ingredients like peas. The fifth ingredient here is cracked pearled barley which is considered to be a good source of carbs that are absorbed more slowly in the gastrointestinal tracts so the blood sugar level stays steady. It’s also a source of fiber. There are a number of other interesting ingredients in this food. Egg productappears as the next ingredient. Eggs are high in protein and very easy for dogs to digest so they get lots of nutrition from them. Canola oil supplies another source of fat in the food. Plant-based fats are not as desirable as good named animal sources of fat but canola oil is a very good fat source. It’s considered to be a very healthy oil and contains linoleic (omega-6) and linolenic acid (omega-3) essential fatty acids at 2:1 making it as one of the healthiest cooking oils at a ratio even better than olive oil. Of course, you won’t be cooking with the dog food and your dog isn’t worried about his cholesterol, but canola oil is also high in calories and it contains vitamin E, which is used in dog foods as a preservative. We also find tomato pomace here which is the pulpy part of the tomato, together with the seeds. It is used as fiber in the food. Some people object that tomato pomace is a cheap filler in dog foods, and they might be right. But it also contains lots of vitamin C, lycopene, and beta-carotene which are desirable. The food also has flaxseed. Flaxseed has pros and cons. It’s often considered good for a dog’s skin and coat because it is a good source of, well, lots of things. It’s high in calcium, iron, thiamin, magnesium, phosphorus, copper, and manganese. It’s also got lots of calories and it’s a good dietary fiber. However, if you are a dog breeder, flaxseed and flaxseed oil have been associated with failure to conceive, smaller litters, and other breeding problems. The food also contains dried kelp which is typically added for its trace minerals and iodine. Blueberries and cranberries are sources of antioxidants. And rosemary extract is often used in dog foods as a preservative. This isn’t a problem for most dogs but if your dog has epilepsy or seizures, rosemary can cause problems. However, it’s hard to find dog foods that don’t use rosemary today. The food uses lots of digestive enzymes, pre- and probiotics such as dried chicory root, dried Enterococcus faecium fermentation product, dried Lactobacillus acidophilus fermentation product, dried Lactobacillus casei fermentation product, and dried Lactobacillus plantarum fermentation product. Their purpose is to help your dog digest the food better. You should also note the presence in the food of chelated minerals which makes it easier for your dog to absorb them. The food also has glucosamine and chondroitin which are usually added as joint supplements, though in most cases if your dog really needs a good joint supplement you should add something in addition to his food to be sure he is getting what he needs. Yucca schidigera extract is added to dog foods to reduce odor from the stool, though it supposedly has some healing properties, too. And, finally, L-Carnitine is an amino acid nutritional supplement that is sometimes added to food to help metabolize fatty acids into energy and keep the body lean. It’s found naturally in meat and dairy products. A dog food might add it to the ingredients, as in this case, when the proteins are mainly fish. The quality of the ingredients appears to be very good. The salmon and ocean fish meal are good animal proteins, especially if your dog has any problems with chicken or lamb, and they are the first two ingredients. The fish meal is also thought to be free of ethoxyquin. There’s no corn, wheat, or soy, if your dog has problems with those common ingredients. The food appears to use natural preservatives. The chelated minerals make them easier for your dog to absorb them and use them. There’s nothing too bad here. Some dogs may have problems digesting the peas but overall it looks like the ingredients are of good quality. Nothing stands out. I find the peas used as protein/fiber to be a potential problem for some dogs but many dogs seem to have no trouble eating foods using peas in this way. However, I think more research needs to be done on peas in the diet of dogs. Tractor Supply Company states the following in their description of this and other 4Health foods: “4health Salmon & Potato Formula for Adult Dogs is specifically formulated to meet the nutritional needs of your adult dog.” However, this is NOT the same as an AAFCO statement of nutritional adequacy and I couldn’t find one listed for the food on the TSC web site. This raises concerns about the nutritional adequacy of this food. 4health Salmon & Potato Formula for Adult Dogs provides 25 percent crude protein (Minimum), which is well above the government’s recommendations (18 percent for adult dogs) and a normal percentage for a premium food. The 14 percent fat in 4health Salmon & Potato Formula for Adult Dogs is at the high end of the government’s recommendations (9 to 15 percent for an adult dog), but good quality fat is good for your dog and the fat in this food comes from the ocean fish meal and the canola oil. The 3 percent fiber in the food is a little low. The government’s recommendations are 4-4.5 percent. You should watch to make sure your dog doesn’t have any problems with constipation. Make sure that his stools are normal and that he has regular bowel movements each day while feeding this food. Tractor Supply Company has a good reputation and they have been in business since 1938. 4Health pet food gets good reviews online and it’s hard to find anyone who has anything negative to say about it. All of the customer reviews on the company’s web site are positive for 4health Salmon & Potato Formula for Adult Dogs and many of the reviews for their other foods are positive (though not all). Diamond does manufacture the food and that will make some people nervous, but it seems to be a very good line of foods. 4health Salmon & Potato Formula for Adult Dog looks like a very good food and there is little to dislike about it (peas, flaxseed, where’s the AAFCO statement, grumble grumble). It seems to be exactly what is claims to be: quality nutrition for a good price. No, these are not organic ingredients and they don’t say the salmon comes from the sparkling waters of the north, yada yada. But it looks like the food provides good nutrition. Recommended. 4Health Salmon & Potato Formula has received our 4 paw rating.